Harvard professor Alice Howland is diagnosed, at the age of 49, with early-onset Alzheimer’s. Beginning with occasional memory lapses like forgetting where she left her Blackberry and becoming lost in her own neighborhood, the novel chronicles her slow but steady decline in minute detail. Her relationships with her husband and daughters change, and her hard-earned career slips away. This was another book chosen by my book group that I didn’t think I would like. Though I find the subject matter fascinating, it’s also so terrifying that I dreaded reading the book. But strangely, this novel made me feel a bit better about potential dementia. Maybe because it’s not such an unknown now, or perhaps because Alice was unaware of so much of what she forgot that at times she was blissfully ignorant. There were some very touching moments in the book between Alice and her daughters, and her graduate student. And some very frustrating moments with her husband who I wanted to slap more than once. But such is the nature of serious illness, especially the kind that changes one’s personality. 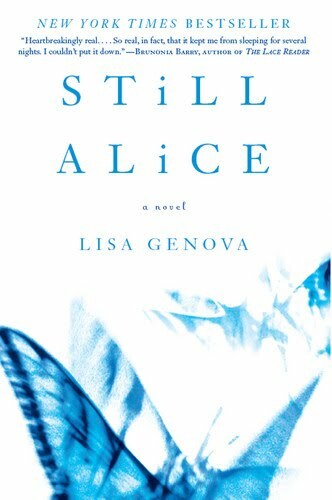 I imagine there are a lot of challenges in writing a book from the perspective of someone with Alzheimer’s disease, but the author did a great job of making us see what is happening to her – things she cannot see – while still helping us feel what she is feeling. She made the moments of confusion confusing even to those of us who are lucid, and that can’t have been easy. If you haven’t read this yet, definitely consider it. I really couldn’t put it down.